I saw Rogue Nation earlier today, and you really should too. It’s a ridiculously complete, focused action movie that’s fun for all sorts of reasons. But there’s one beat in particular that I loved. Back in 1995, thrown sideways and on fire into University and still trying to figure out what the Hell I was doing I’d been to see The Usual Suspects. Two minutes from the end, in the middle of the big reveal, I started laughing. Not at the movie but with it. The moment where Dave Kujan puts together just what he’s been listening to is a beautiful moment of cinema. Everything about it; Verbal’s transformation, the look on Dave’s face, even how he moves is perfect. It’s a magician showing someone a magic trick so obvious yet so subtle they can’t see something happening right in front of them. It’s the sword strike so perfect the target doesn’t know it’s been cut. It’s elegant, graceful art that trusts you, and itself, enough to show you how it was done. I used to be a stage magician so I love seeing how a trick is performed as much as what that trick is especially when it’s well executed. So I laughed and applauded and was still laughing as I walked out into the Ripper-ish night of November 1995 in the middle of York. Rogue Nation has a similar moment, and it’s no accident that Chris McQuarrie was behind both scripts. In this case though, it’s not just an elegant piece of cinema but an acknowledgement, and conclusion, to a dialogue these movies have been having with themselves for 20 years. Mission: Impossible as a premise has magic and misdirection built in. The whole point of the IMF is they’re the smartest people in the room. In fact, odds are they own the room. And the building. And the building is in a different city to the one you think it’s in. And that guy’s wearing a mask. It’s subtle, elegant con artistry. By contrast the first Mission: Impossible movie ends with Ethan Hunt explosion surfing down the Channel Tunnel. These movies have got bigger and crazier and for the most part immensely more fun as they’ve gone on. But the misdirection, the idea of winning by being smart rather than by being Tom Cruise has fallen by the wayside a bit. 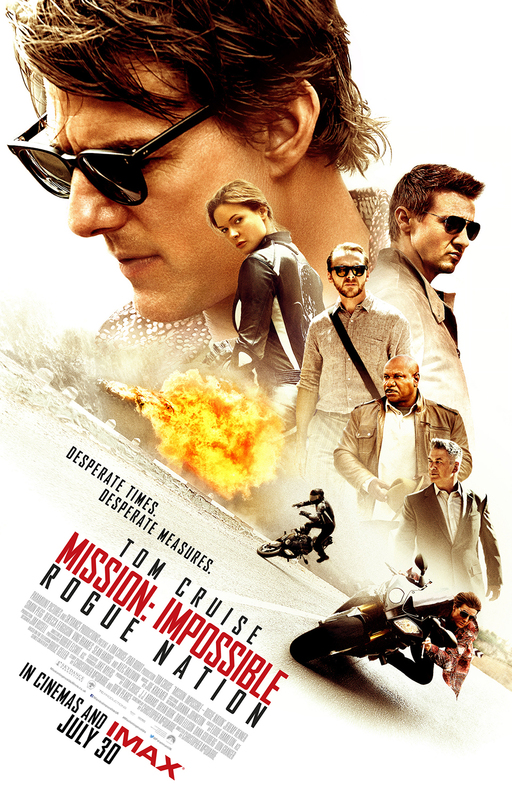 The ending of Rogue Nation is a chase through London that culminates in a badly wounded Ethan being pursued into the subflooring of an office building by villain, Solomon Lane. Lane corners Ethan, prepares to finish him off and…finds himself in a bulletproof glass cube. And Benji fills the cube with knockout gas. It’s a nice piece of symmetry, given Lane captures Ethan in a similar manner at the start of the movie but it also plays like a restatement of intent. This time they haven’t won via a mismatched last second fistfight or vehicular catastrophe. They’ve won by being smarter than the other guy. They’ve won with smoke and mirrors. And, again, I laughed all the way home.